Adding this to the news section in November of 2006, it's interesting to look back at this one. This article caused Angie Buchanan and Christian to have some wonderful conversations over the telephone, while Selena Fox sat on far too high a pedestal to deign to come to us and ask us what we Witches in Salem were up to. This article shows how much the Witch world has gone from aging hippie to urban hipster. It is interesting to note that The Vampires' Masquerade Ball went from zero to hero in just three short years. You can't get a ticket to it in the last week! SALEM — Although not quite Hurricane Ivan, a storm is swirling in the witch community over a controversial poster promoting an October vampire ball in Salem. Thanks to the Internet, the winds of protest are blowing across the country. "We've had many calls and e-mails of concern," said Selena Fox, executive director of Lady Liberty League, a pagan civil rights and religious freedom organization based in Wisconsin. Fox said she began getting calls following a Salem News story about lurid posters appearing on telephone poles and buildings in the downtown showing a woman in a bikini covered in blood and wearing vampire fangs. The story was picked up by witchvox.com, a pagan news Web site. 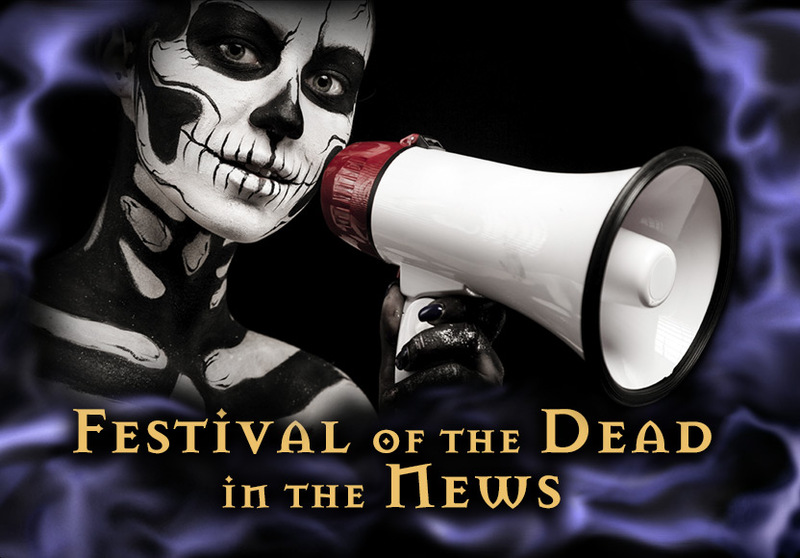 The poster advertised a vampire ball run by two local witches, Shawn Poirier and Christian Day, as part of their Festival of the Dead. When the police and business officials got calls last week, the posters came down. "There is concern from some that people would get the Wiccan religion and vampirism mixed up and would think the Wiccan celebration of Samhain somehow has something to do with dripping blood and scantily clad females, which is not part of our tradition," Fox said. Samhain is a pagan religious holiday that coincides with Halloween. But opinions vary within the local witch community. Teri Kalgren, who heads the Witches Education Bureau, thinks the protest has been blown out of proportion. "It's a vampire thing," she said. "It's not about witches." Kalgren also co-owns a local shop, which is selling the $95 tickets to the ball. Some, however, are concerned that the R-rated posters about a vampire ball send the wrong message about witches. "I like them personally," said Marie Guerriero of PRANCE, another witch education group, about the two promoters. "(But) I'm looking at this as a family city where we are trying to promote a positive image of witches, and I think it just rubbed a lot of people the wrong way." But not everybody. "We've actually had people come in and ask to buy the poster," said Kalgren. "They thought it was really cool, and that's not just witches. I had a man in his 60s come in and ask if he could buy it." If the local business community is upset, they are not showing it, Poirier said. In fact, he said they were cheered at a Chamber of Commerce event last week when they gave away two free tickets to the ball. If nothing else, the poster accomplished its mission: Tickets to the ball are selling, Kalgren said, and Salem has attracted national attention again. "We got probably over $250,000 worth of publicity for this entire city," Day said.